A genus of chiefly American perennial herbs of the dogbane family (Apocynaceae) with opposite leaves and small white or pink flowers comprising the dogbanes of which several are the source of substances with physiological activity resembling digitalis. Dogbanes are perennial herbaceous plants, with poisonous milky juice, bearing slender pods in pairs; said to be poisonous to dogs. 1. A mixed-breed dog, especially one that is ill-natured or in poor condition. 2. A contemptible person; an offensive term for someone regarded as mean, cowardly, or otherwise unpleasant. 3. Etymology: Middle English curre, perhaps of Scandinavian origin; however, it is not directly related to this Latin cyno-, "dog" family. It has been included because of its significance to the "dog" topic presented in this unit. 2. Resembling a cur; like a mongrel (dog that is a mixture of different breeds). 3. Etymology: this term is NOT related to the Latin cyno- family; however, it was placed here because of its relevance to this unit. Being snarling, rude, and bad-tempered: "The customer's currishness made it very difficult for the clerk not to respond in a negative way." "The currishness of the couple resulted in their having an irritable and unpleasant disposition while they were discussing how much they would be spending for the trip." 1. The delusion or madness that a person has about being a dog which is imagined by him or her who barks and growls. 2. Insanity in which the patient behaves like a dog: Jim's father started to have delusions during which he barked and growled, imagining himself to be a dog. The art of hunting with dogs. These sect members had a doglike insolence, a doglike disregard for social customs, a doglike use of tubs or kennels for sleeping, and a currish insistence upon one's own opinion. It may have been a coincidence that the Greek word for "doglike" is cynikos. 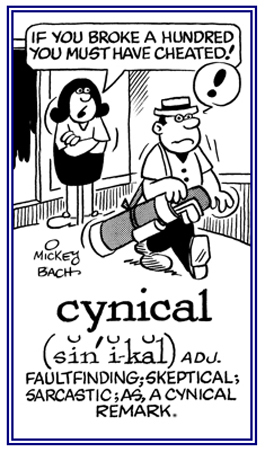 The word cynic had not been in English very long before it was applied to any faultfinding critic, especially to someone who doubts the sincerity of all human motives except self-interest. Thereby Hangs a Tale by Charles Earle Funk; Harper and Row, Publishers; New York; 1950, page 88. The Greek word kunikos, from which "cynic" comes, was originally an adjective meaning "doglike", from kuōn, "dog". The word was probably applied to the Cynic philosophers because of the nickname kuōn given to Diogenes of Sinope, the prototypical Cynic. The first use of the word recorded in English, in a work published from 1547 to 1564, is in the plural for members of this philosophical sect. 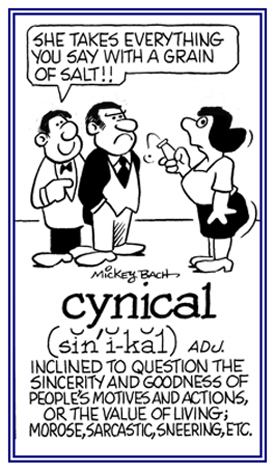 In 1596, we find the first instance of cynic meaning "faultfinder", a sense that was to develop into our modern-English usage. The meaning "faultfinder" came naturally from the behavior of countless Cynics who in their pursuit of virtue pointed out the various flaws in others. Such faultfinding could led to the belief associated with cynics of today that selfishness determines human behavior. Spasm of the facial muscles causing a grin or snarl like a dog.